Our Board of Directors has authorized the Israel Solidarity Tzedakah Committee to take the lead in an emergency campaign to raise funds in order to provide at least one armored van for the Jewish families of the Shomron region. These armor-protected vans are used to safely transport elementary and special-needs children to schools several miles away, as well as serving other urgent community needs as they arise. The current security situation In Israel has made travel on the roads extremely dangerous. By working in concert with the Israeli government’s Ministry of Defense and the local regional councils, the One Israel Fund is able to purchase this vehicle for a donation of $25,000, although the actual cost of these vehicles is $135-140,000. 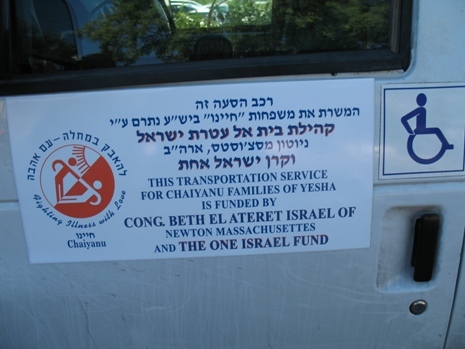 To date, One Israel Fund has provided over 65 of these vehicles for the more than 220,000 Jews living in YESHA areas. Funds provided for this project are forwarded to Israel on a dollar-for-dollar basis donated. Our objective is to fund a minimum of one van, and preferably two or more. What better way to participate in a Mitzvah and to commemorate joyous occasions in our lives such as weddings, bar and bat mitzvahs, births, etc. than to potentially save Jewish children from harm, or worse. This is a rare opportunity for all of us to truly impact the safety of the Jewish families of YESHA. As caring Jews, we must do all we can to help our fellow Jews, who are on the frontline of the current anti-Israel terrorism and murders. It is up to us to provide the support they so desperately need. Let them know that they don’t stand-alone. We are calling upon all members of the Congregation to do everything they possibly can to support this effort now. The side of the vehicle will proudly feature our congregation’s name so that all of Israel will know we American Jews, over 5000 miles distant, stand beside them in their hour of need. Please send your tax-deductible checks to the shul office. The check should be made payable to Congregation Beth El-Atereth Israel, with the notation of “One Israel Fund—Armored Van” in the memo line. Israel Solidarity Tzedakah Committee members are Ronald Ellis, David Fisher, Sy Kraut and Phillip Levy. If you have any questions or are interested in any more information please contact Sy Kraut, chairman of the shul’s Israel Solidarity Tzedakah Committee.